In this 4-minute clip, Joe Van Wyk of Van Wyk Design captures the essence of what I do artistically and why. "From Wiring Motors to Wiring Lamps...Manifesting a vision one step at a time" -- The Anvil's Ring, Winter 2015 issue. 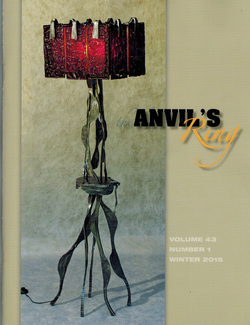 This 'Boudoir Floor Lamp' commission is featured on the cover of The Anvil's Ring (Winter 2015), the quarterly artist-blacksmith magazine of ABANA. This project took a year and half -- and plenty of patience -- to complete. Many thanks to Austin-based photographer Wendy Ogle for the top-notch pictures accompanying the article. "Blacksmithing a Garden Gate" -- East End Historical District Newsletter. Galveston, TX. Scroll to page 4 to read about this 'Stylized Pod' garden gate made and installed in Galveston, TX.